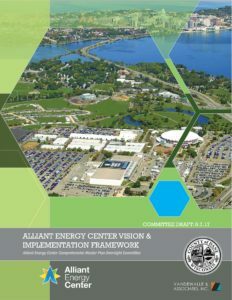 Alliant Energy Center Campus Master Plan - Visioning Process | Vandewalle & Associates, Inc. In 2016 Dane County began working with Vandewalle & Associates on the first two phases of a four-phase, multi-year effort to develop a strategic vision and market-driven, financially sustainable plan for the 164-acre Alliant Energy Center campus. Needs and background. The AEC campus serves as the region’s premier, multi-venue expo, convention, and event destination, providing the regional community with a place to gather, share information, and attract visitors. AEC offers tremendous unrealized potential to leverage its close proximity to the downtown and to Lake Monona—assets which set the City apart as a venue for large national events, and which are proven particularly relevant during large-scale and national level events such as the AEC’s recent hosting of the CrossFit games. Veterans Memorial Coliseum holds more than 10,000 visitors and is utilized for sporting events, large concerts, and entertainment productions. Exhibition Hall is the premier facility for conventions, meetings, banquets, and much more, consisting of 255,000 square feet of space. Willow Island is a 29-acre outdoor venue surrounded by two ponds and is used for outdoor festivals, concerts, and other outdoor events. 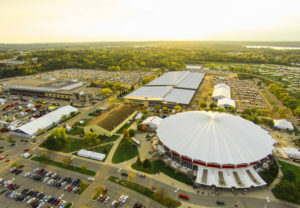 The New Holland Pavilions, totaling 290,000 square feet, make Alliant Energy Center an industry leader in agricultural shows. These multi-use buildings also can be used for exhibition space, trade shows, and more. The Arena, 22,000-square feet of exhibition space, suits a multitude of smaller events including trade shows, staged performances, and consumer events. vestment in the surrounding areas of the City, as well as provide economic benefit for the entire County. Implementation of the Vision will require a sustained effort over the next decade and beyond; but the next two years are critical to continuing the planning process.